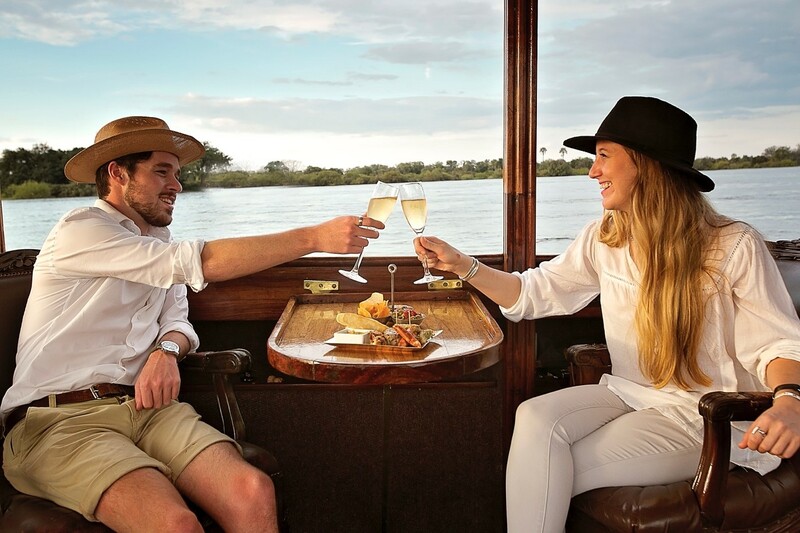 What better way to celebrate the end of another beautiful day on safari than by toasting to it? 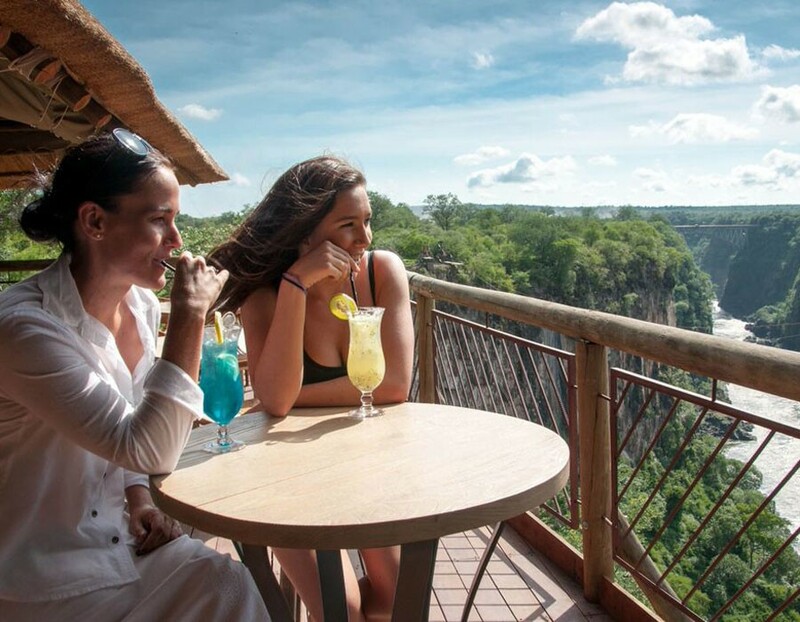 A sundowner in Victoria Falls is guaranteed to always be a memorable experience and paired with a spectacular view, relaxed setting and an ice-cold drink in hand, what more can you wish for? To make it easy for you, we have put together a list of Top Five Places to enjoy a sundowner in our beautiful Victoria Falls town. 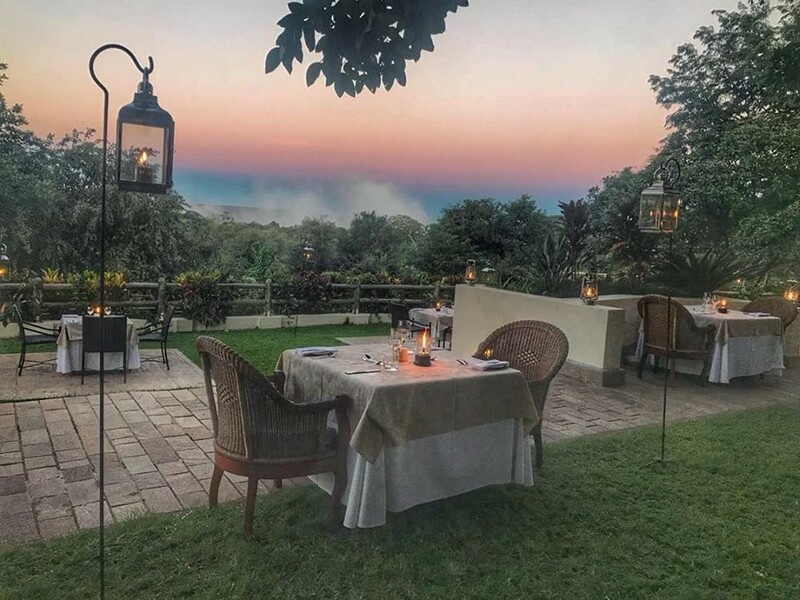 The closest hotel to the Victoria Falls, a mere eight-minute walk away, Ilala Lodge Hotel offers the perfect setting for a sundowner where you can marvel at the spray of the Falls rising into the sky and watch the hues changing from blue to red as the sun dips over the horizon. Sunset views with a difference from Ilala Lodge Hotel. Our Pool Bar has a range of delicious cocktails, ice cold beers, an extensive wine list and our newest addition to the menu, a selection of gin boards. If you arrive early, you can settle in for a few hours before the sun goes down, soak up the spectacular view and enjoy a drink of your choice and our homemade snacks. Our Pool Bar bartenders are ready to serve up your drink of choice. If you would like to have dinner afterwards and have not yet dined at The Palm Restaurant, then you are in for a treat! Picture starry skies, gourmet cuisine, attentive service and with the roar of the Falls in the distance, could you ask for anything more? Wildlife of course! So be on the lookout for passing elephants, bushbuck and warthog who frequent the front lush green lawns for a dinner time snack. Don’t forget to bring along your cameras to capture that picture-perfect shot with your new dinner guest! 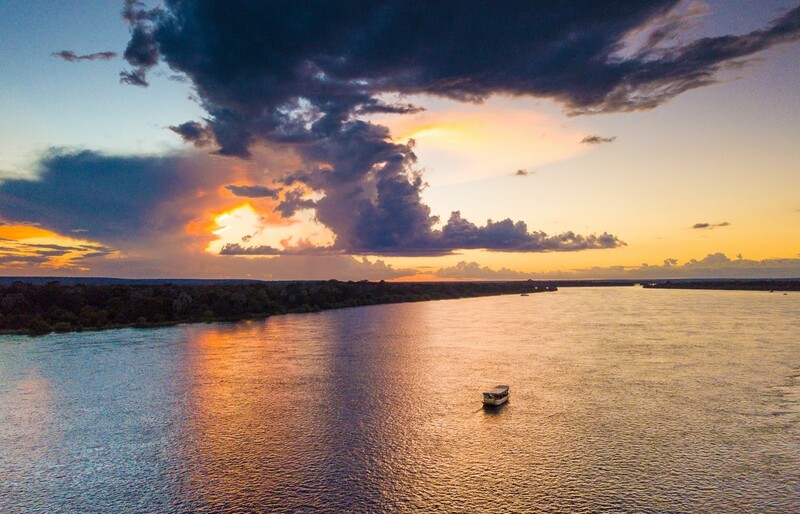 No two sunsets over the Zambezi River are ever the same which makes every sunset cruise aboard the Ra-Ikane one to remember. As the sun gently descends and with the river as still as glass, you will be surrounded by a mass of brilliant warm colours that flood the sky and water around you. From afar the boat looks as though it is floating on an orange and purple sea. Every sunset on the Zambezi River is a thing of beauty. A wide range of premium drinks and an array of mouth-watering canapes are served onboard, while an experienced and knowledgeable Boat Captain navigates the inner channels of the river, taking you up close to wildlife and birdlife on the banks. This is the quintessential Victoria Falls sunset experience and is a must for your African safari bucket list! A luxurious and memorable way to end the day in Victoria Falls. The Bushtracks Express train ride is the ultimate land-based sunset experience providing an elegant and opulent journey back in time. 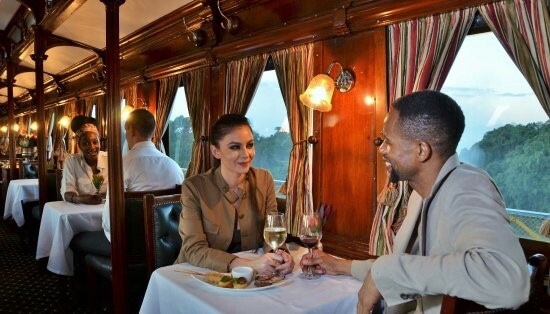 The exclusive rail trip runs from the Victoria Falls Station to the famous and historical Victoria Falls Bridge, linking up the two countries, Zimbabwe and Zambia. You will be treated to lavish snacks and unlimited premium drinks throughout this two-hour journey. Remember to raise your glasses as you enjoy an exceptional 360-degree view of the Falls from the iconic bridge! A trip back in time on the Bushtracks Express. 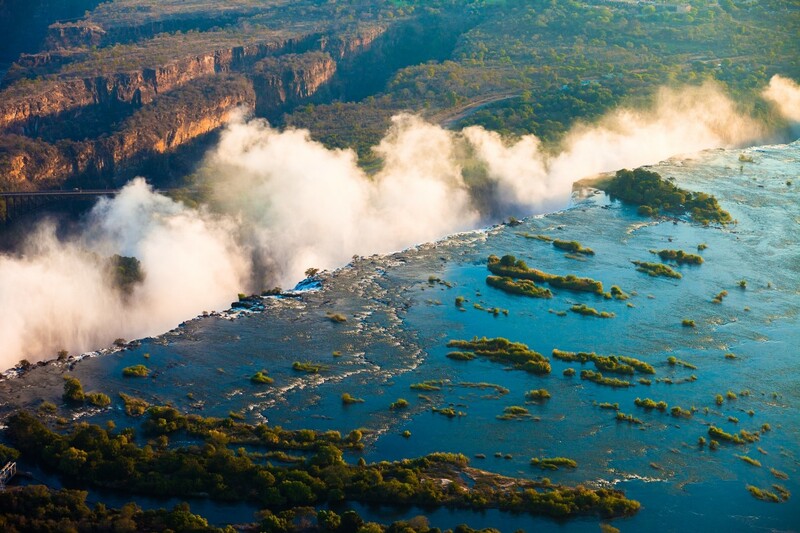 Located 120 metres above the furiously flowing Zambezi River, The Lookout Café, overlooks a series of steep gorges, with the Victoria Falls in the distance. This splendid location offers one of the best and closest views of the Victoria Falls Bridge and of the mighty Zambezi Rapids which flow beneath it. From the comfort of the café, keep an eye out for brave thrill seekers doing a last-minute bungee jump or swinging themselves off the gorge, while enjoying a selection of iced drinks and snacks. A top experience at The Lookout Café. 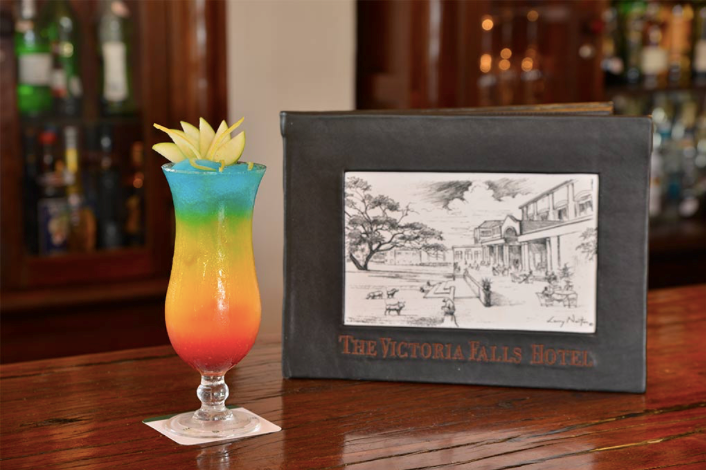 If you’re looking to take a step back in time, we recommend a trip to the historic Stanley’s Bar at the Victoria Falls Hotel. Nodding to the bygone era, this cosy bar offers a delicious range of drinks including a selection of signature cocktails and gin and tonics which can be enjoyed on the veranda while looking out over the Victoria Falls Bridge. Colourful cocktails in the cosy bar. 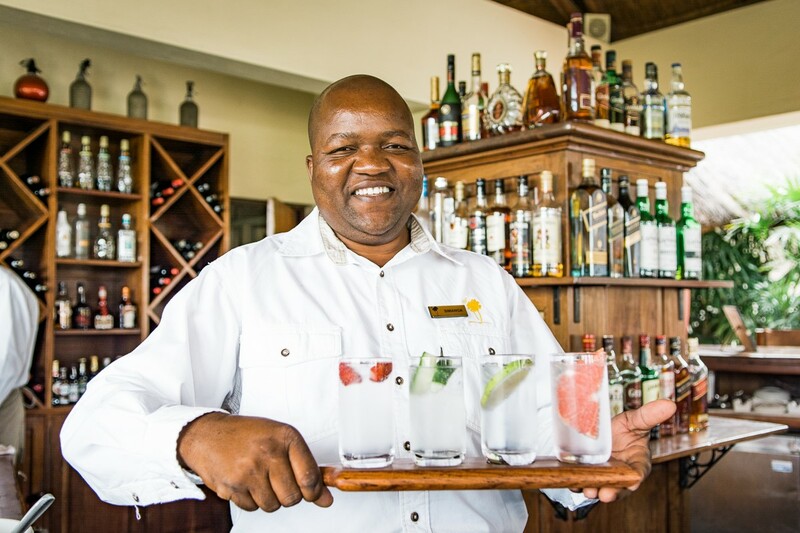 No matter where you go in Victoria Falls, you are guaranteed a friendly smile, delicious drink and with one of the Seven Natural Wonders on your doorstep, an unforgettable sundowner.